As I went around the house flipping all of our calendars (yes, I’m the type who requires calendars and clocks everywhere) my eyes settled on August 1st. It’s my sister’s birthday today (Sunday). How old would she have been? I had to first remember how old I am and add five and… It has been over six years since Kris passed away, but I still think of her every day. People who have lost siblings have told me that you never stop thinking of them. I don’t think that’s a bad thing. Jeremy came home Saturday evening after a week in Oxford and it feels like life has returned to normal. Whatever normal is, I like it. Today was overcast, cool, and rainy. A nice respite from the heat. But I’m still prepared for the hot weather because I know it’s coming back soon enough. Oh yes. 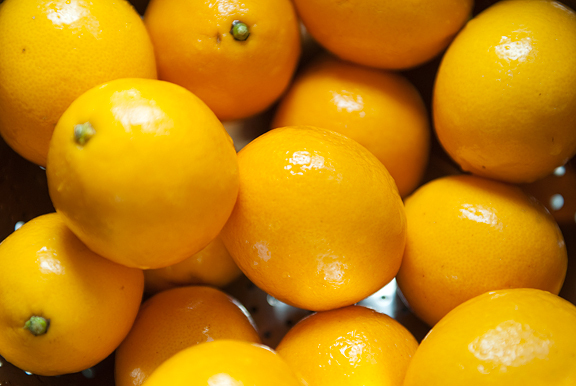 Back in May (which seems so far away now), I purchased two bags of Meyer lemons from Whole Foods as their season was quickly coming to an end. After depleting our supply of Buddha’s hand citron vodka rather quickly, I figured it was high time I tried my buddy Figs’ recipe for homemade limoncello. These are the types of projects that require patience, planning, and the ability to forget. You can’t make it and consume it the same day. While the Buddha’s hand citron vodka took 40 days, this took 80 days. I hid it away in my office closet where it could stay in the cool and dark. There were plenty of things to distract me from the limoncello, but when I remembered it, I’d get excited about the day it would be ready. I scored a couple of gallon-size Ball jars for my boozy infusions. Even though I don’t drink much of this stuff, I love the idea of making your own. Just love it. They make great gifts, it’s fun to serve cocktails at parties with them, AND I love the look that the cashier gives me when I slap several giant bottles of cheap vodka on the counter at the booze barn. They think I’m a lush, but I can barely function after 3 ounces of wine! I made a slight mistake in my enthusiasm and poured both bottles of vodka in with the lemon peels at the start. My buddy, Figs, instructs us to add one bottle because the second bottle goes in at the 40-day mark. I think it’s okay. I do. But you should follow her instructions nonetheless. Did I mention you should use cheap vodka? Yes, save some bucks, use the cheap stuff. When I tasted the limoncello two weeks ago, it reminded me of Listerine. I can’t really trust my opinion when it comes to booze though. I prepared a bottle to bring to Manisha as a hostess gift. She told me it was delightfully lemony. I can’t drink it straight because I’m a ninny like that. So I made a total girl-drink with it. It’s lovely. A limon sunrise! Girl drinks rock my world because they are colorful and fruity – two of my favorite things. We toasted Kris’ birthday with our glasses of sunshine as the rain soaked the world outside. It’s your outlook from within that matters most, no? Fill a high ball with ice. 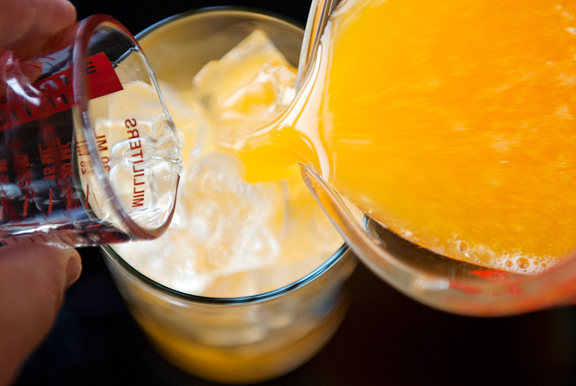 Pour the limoncello and orange juice into the glass. 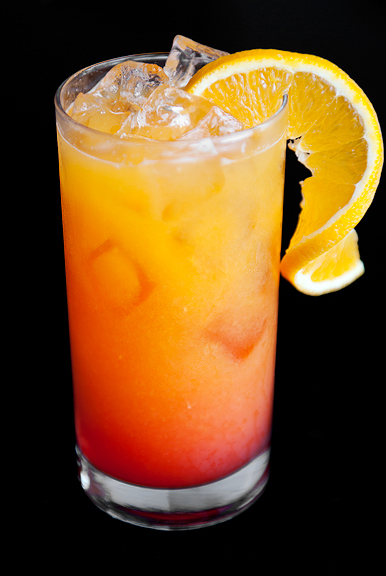 Top with a splash of grenadine, but don’t stir if you want the “sunrise” effect. Let it settle to the bottom. Serves 1. Brush and wash the lemons well, pat dry. 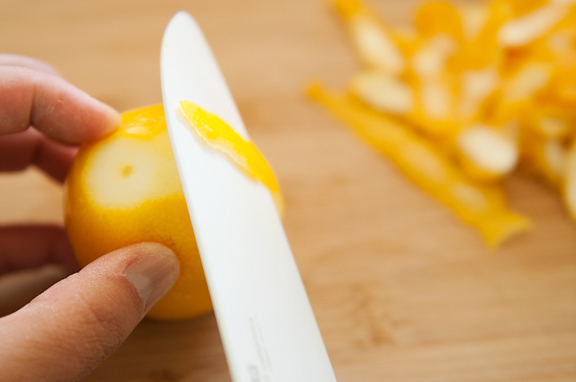 Remove peel with knife or peeler. 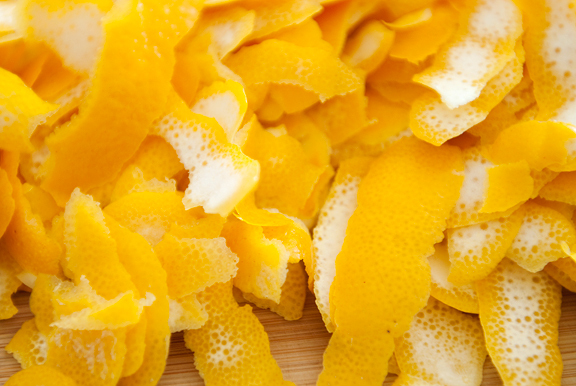 Remove any pith from the peels. Place the zest in a 1 gallon jar. Pour 750 ml of the vodka into the jar over the zest and seal. Let sit for 40 days in a cool, dark location. After the 40 days are up, combine the sugar and water in a medium saucepan over high heat and stir to dissolve the sugar. When the contents come to a boil, let continue to boil for about five minutes. Remove from heat and let cool. 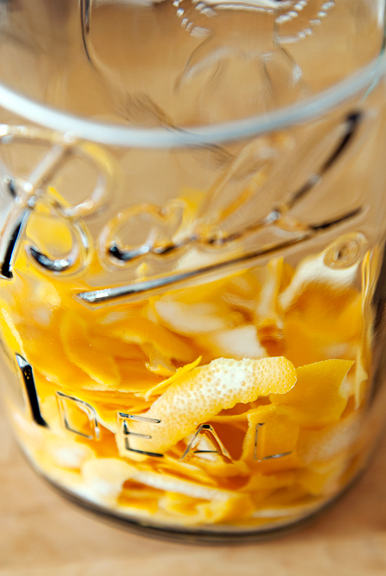 Add the sugar syrup and the rest of the vodka to the jar of lemon peels. Seal and let sit for another 40 days in a cool, dark location. Woohoo!!! Makes a gallon. Sounds yummy! Going to try this soon, so it will be ready for the holidays. How is limoncello a girl-drink? Interesting. Even though I don’t drink alcohol, this drink does look lovely. Wow… Your sunrise looks amazing. The colours are so beautiful! I love limoncello! I too made some a few months ago at the beginning of Meyer lemon season, but instead used Everclear. It was too strong for my taste so I’ll have to try it again with vodka. Such a refreshing beverage for warm summer days! Also, I’ve been reading your blog for awhile now and you mention your sister every now and then. I am so sorry for your loss. My brother died two years ago in a car accident and like you, think about him everyday, without fail. My parents are still grieving. I’m not sure if you’ve mentioned it, but do you mind sharing how she passed away? If it’s too personal, I understand. You and I seem to have quite a bit in common this week. Both of our spouses are astrophysicists (something which has lasted much longer than just a week I’m happy to say). 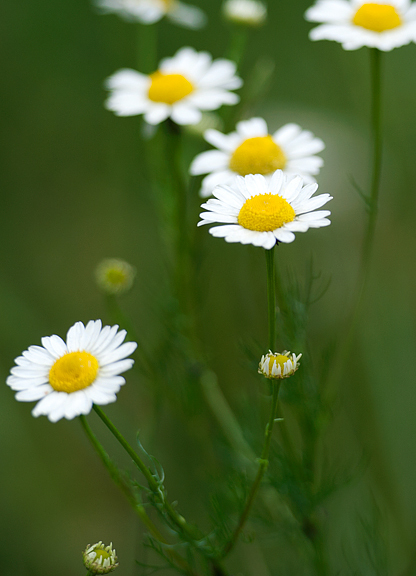 Sadly, both of us lost beloved members of our families at the same time of the year (my mother – 12 years ago at the end of July – the 28th to be exact which I have been thinking of this past week). And, believe it or not I put down the first stage of limoncello this past saturday. It sits on the bar in my basement, macerating away. I have a friend in Fiesole Italy who swears by Everclear grain alcohol. I’ve made it in the past with vodka. I stopped by the liquor store and purchased the Everclear for this batch. We shall see which tastes better – at least the taste test will be fun! Do you keep yours in the freezer? I love the grenadine idea. Gonna give that one a go and sip it out by the pool. Love the giant Ball jars! I used an Ikea jar for this batch but yours are much prettier! Gawd I hear ya; wish I could hold my alcohol better (I’m blaming my bad genes) because I love the stuff but truth be told, three sips and I’m done. Call me a cheap date, I guess. 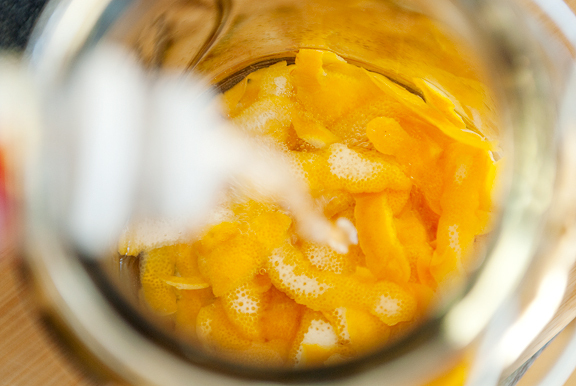 do you leave the lemon peels in the jar even after the 40 days? Great! I’ve got a bottle of limoncello waiting for me in the freezer and now I have a fabulous new way to use the fruits of my labor. Thanks! I just finished a batch of homemade vanilla extract as per your instructions, so I think this is the logical next thing to do, right? Looks great! We love limoncello. I have two recipes waiting to be tried sitting on my desk. 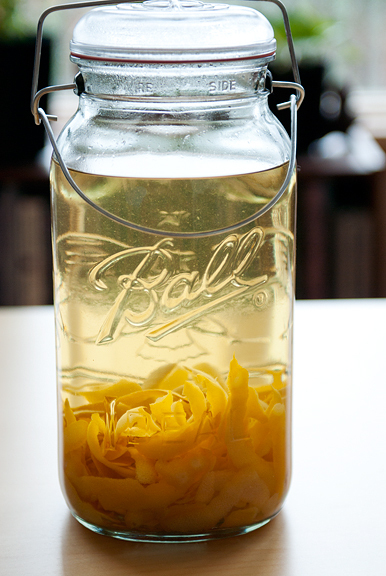 i have been wanting to make my own limoncello forever– think i might give it a try this summer after all. i love your drink recipe! 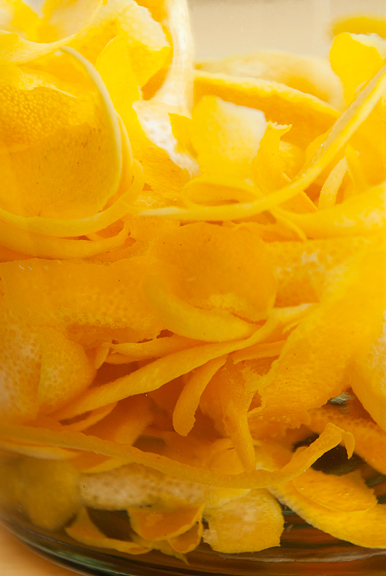 That picture of the lemon peels is just stunning! I’ve never made limoncello but I’ve always wanted to. I’m going to have to try this. Oh, I’m totally making this! Thanks for the recipe. I’m not a straight-liquor girl, either. But the cocktail looks wonderful! 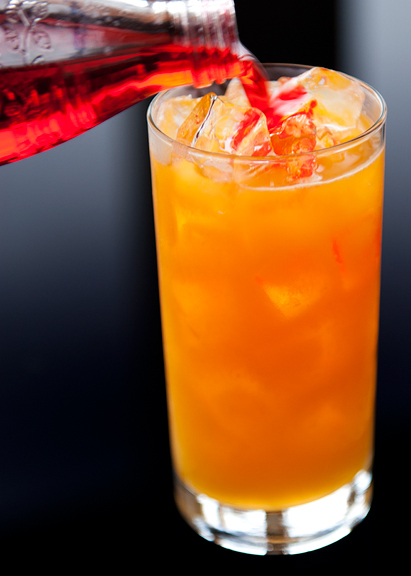 And also–thanks for another drink recipe! Although the MIL could drink lemon drops until the end of time, I’m getting tired of them. I wish I could offer you a real hug. I wish it could help. I’ll do what I can and let you know I’m really sorry. I think you are very strong. I’ll bet your sister would be proud of you. But that last bit wasn’t my place to say. I’m sorry. i used to have a lemon tree in my backyard that had peels a half inch thick. when i first discovered this i thought there was something wrong with the tree! turns out they were sorrento lemons and they made the absolute best limoncello, and it didn’t take anywhere near 80 days to make… i got the recipe from “molto mario” (le sigh… i much preferred food network when they aired things besides pastry challenges and cupcake wars). it takes a week and 4 days to make, and it totally smokes anything that comes from a bottle. I went to the county fair today (opening day) and while I was looking at the wine and beer entries, I noticed some limoncello. Right away I knew I had to look for a recipe and prepare for next year’s fair. I live in lemon country, after all! Thanks for the post. My thoughts are with you. Nan – I don’t keep mine in the freezer, mainly because the jar is too big. I need to get out and buy some more small bottles for gifts and just for ease of use. I hear sipping it chilled is quite nice too! Marie – this I do not know. I mean, mine are still in the jar because I haven’t gotten smaller bottles to divvy it up yet. My guess is that after 80 days, the peels aren’t going to change much more? Kristin – I use most of my flavored booze in desserts too! Abby – isn’t it pretty? I think I like it more for the pretty than anything else. Stephane – that’s very kind of you, thank you. No worries at all. joolz – thanks, I’ll check it out! 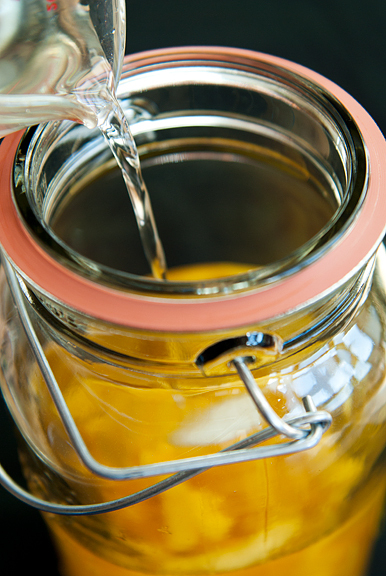 Hi there – can you tell me what kind of container you used for gifting the limoncello? I must know! I will make this for Christmas gifts!!! MamaCissy – I just go to a local homebrew store which sells all sorts of nice glass bottles. 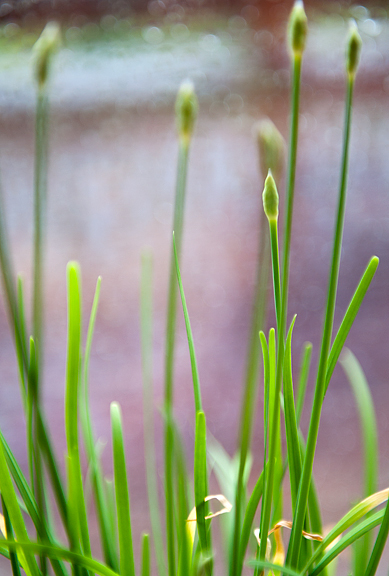 They are usually tall, thin, and clear glass – no decoration or design.